Question: How does a motor work? Magnet - Should be able to conduct electricity, so ceramic magnets won't work. Neodymium magnets work very well. 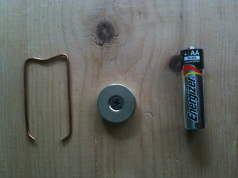 Battery - Preferable to use different sizes (C, AA) to study what causes the motor speed to change. 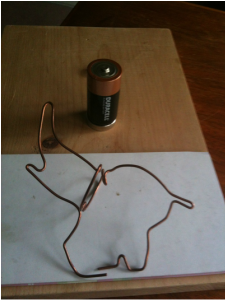 Wire - Needs to be bent to shape, so that the wire touches the battery end and the magnet to form a closed circuit. 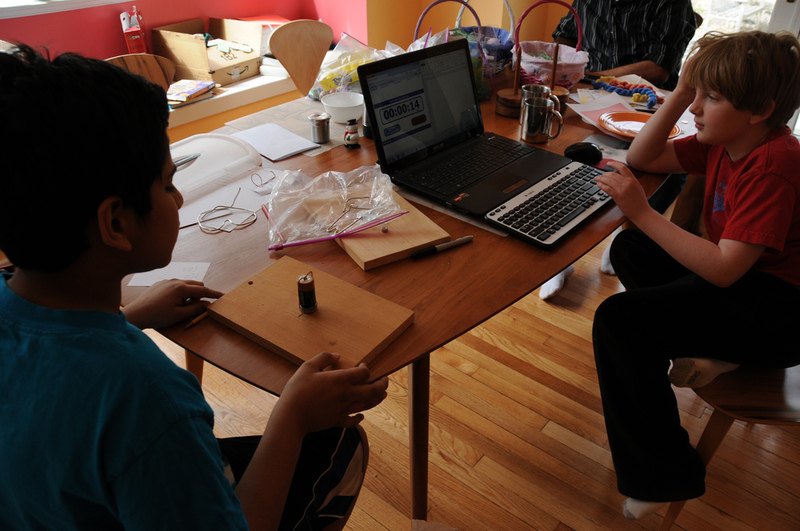 Preferable to use different materials to study what causes the motor speed to change. We tried several shapes, some of which are shown below. Neodymium magnets are very powerful and magnetic materials snap onto them very quickly and forcefully. Be careful while handling, as finger may get pinched! Secure the magnet to a large wooden board with a screw. Place the battery on the magnet. Place the wire loop on the battery making sure it touches the top of the battery. The wire spun when placed on the battery! The permanent motor always has a magnetic field. The wire, however, does not except when it is electrified. Then the wire becomes an electromagnet which has a magnetic field. The wire's magnetic fields interact with the permanent magnet's magnetic field, and the wire spins! Every magnet produces an invisible area of influence around itself. When things made of metal or other magnets come close to this region of space, they feel a pull or a push from the magnet. Scientists call these invisible influences FIELDS. You can make magnetic fields visible to the eye by using iron chips sprinkled on a piece of paper with a magnet underneath. Rufus is ten years old and lives in Somers, New York. He has a cat and two parakeets. He is in fifth grade in Mrs. Trinkle's class at Somers Intermediate School. He enjoys building electronics, Minecraft and messing around with /html/. 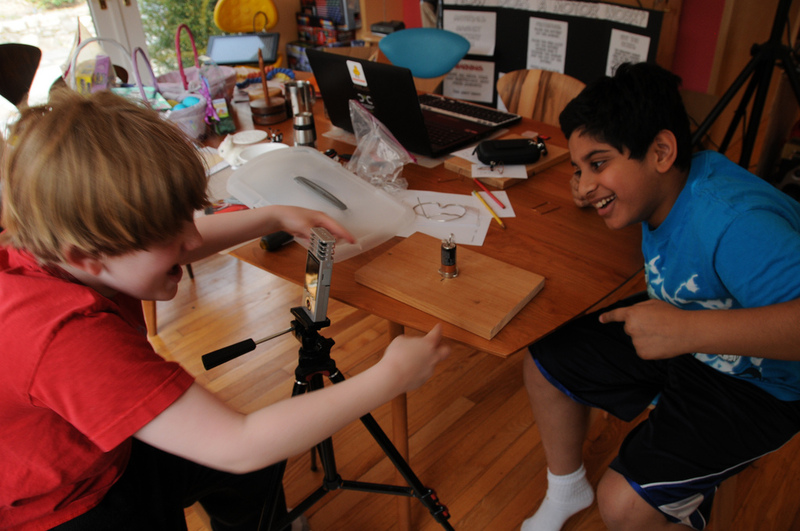 Raghav is a ten year old who is very interested in Science, Geogaching and Cartooning! He loves to ride his motorcycle and play the blues on the piano. He is in Ms. DeBellis’ fifth grade class.